Good, if not better food experience was one of the things that came up in my recent conversation with J about things that we plan to do more in 2018. There is no doubt that our love for food in general has grown in the last two years. And with that, I am glad that I now have learned how to cook better because this means that we don't really have to go out and spend money in order to enjoy delicious food. 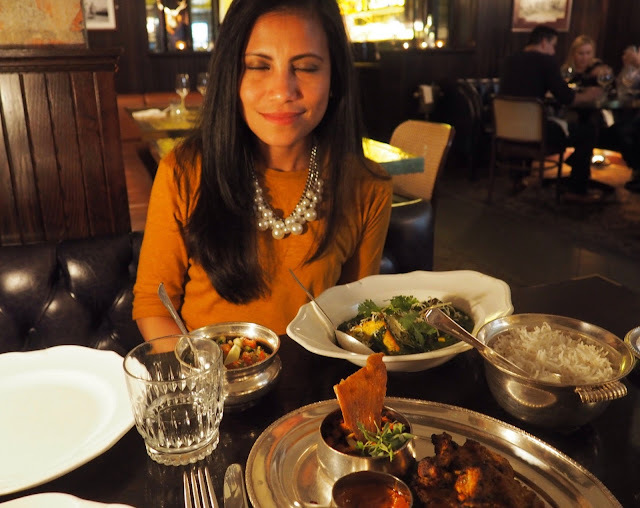 In 2017 though, without even realising it, we dined out in some of the finest restaurants in London more than I ever did since I moved to London 5 years ago. Most of the food that we ate last year truly ignited my senses and sent me to foodgasm. 2017 gave me the opportunity to connect more with food, hence providing me with the best London dining experiences to date. - A few years ago, I went to The Ivy for the first time to try their (then) famous sticky toffee pudding. After that, I went back a few more times but for different reasons. In November last year, I went back again, this time with J and his parents. I've always loved The Ivy because of it's stained-glass windows, classy interior and extensive collection of art deco paintings. However, it was noticeable that the restaurant has undergone some facelift as I couldn't remember the bar in the middle being that big. Even the menu has changed. One good thing though, the food remains excellent, and the service- exemplary as usual. For starters, we had Crispy duck and persimmon salad which was uber delicious. For mains, I had the Yorkshire pork cutlet (£23) which surprisingly came in quite a big portion. J and his dad on the other hand, had the deep fried haddock (£19). His mom only had salad because they had a heavy lunch. Unfortunately, my favourite sticky toffee pudding was not on the dessert menu. I could have asked for it anyway, but the pork really filled me up. But at least I have an excuse to go back. - Last year, I discovered that lunch was a cheaper way to experience Michelin-starred dining. I prefer it now to be honest because it's less pretentious and much quieter than dinner. Our dining experience at Joel Robuchon in Covent Garden was truly amazing. Everything was of the highest standard from the moment we stepped in the restaurant until we left. The £39 per person three-course meal plus a non-alcoholic drink was cheap in my opinion, considering the quality and the amount of food that we were served. Plus the outstanding customer service from the all-smiling staff. - A few months ago, J's mum sent us a magazine with a list of the 100 best restaurants in Britain. On the list was our neighbour, The Palomar. I wondered why whenever I passed by the restaurant, day or night, there was always a long queue outside. Out of curiosity, we visited the restaurant and I can easily say that this Israeli restaurant is now one of our favourite restaurants in London. It was my first time to experience Israeli food and it was amazing. We prefer the dining room than the kitchen bar because it's quieter and more comfortable for us. - As a separate treat for my birthday last year, J brought me to Clos Maggiore for lunch. Clos Maggiore is known as the most romantic restaurant in London. Unfortunately, the conservatory wasn't available at the time, so we were seated in the private dining room upstairs which was equally romantic sans the fake cherry blossoms and the fireplace. The ambience was warm and intimate, and our waiter was friendly and attentive. I couldn't really fault the food as it was delightful. To start, I ordered the Dorset crab which was very tasty. J ordered the Windsor Royal park venison and Wagyu beef terrine. I was craving for duck that day (as any other day), so I had the mouth-watering Honey-glazed Goosnargh duck for my main course. J ordered the oven roasted chicken breast which he thoroughly enjoyed. For desserts, J opted for the European artisan cheeses which was overwhelming. I went safe and had the creme brulee because why not? Oh, I had an extra dessert because it was my birthday, plus a candle to blow. All for £34.50 per person. 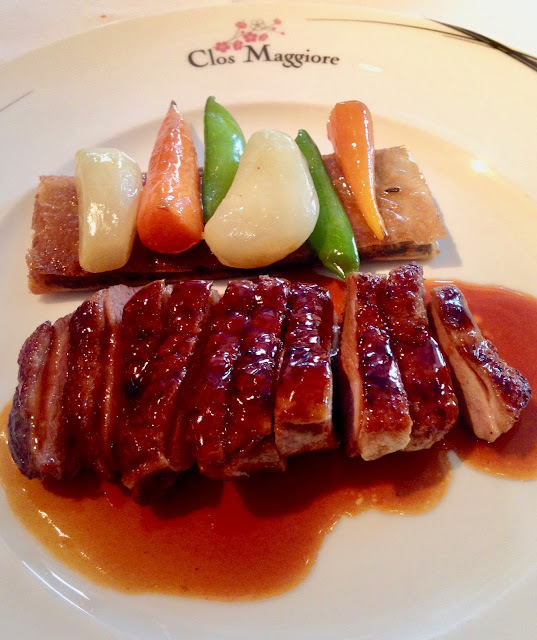 Clos Maggiore was indeed a very memorable dining experience for us. - Although I have stayed at The Ritz once before, I really never dined there. So when my niece visited in February last year and invited me to The Ritz for an afternoon tea, I didn't hesitate. It was the best way to cap off her visit to London. I expected nothing but a first class afternoon tea experience and my expectation was truly met. We had our own waiter who was very polite, friendly and obliging. The food was flawlessly presented, and delicious of course. It came in two batches unexpectedly, so we didn't finish the whole thing as it was a bit too much for petite ladies like us. But we nevertheless enjoyed the food and the whole glamorous experience. - Breath-taking views, impeccable service and exquisite food- what else could I have asked for in a restaurant? We brought J's parents to Hutong in April last year and we were very impressed. When I made the booking, I requested for a table by the window and that was exactly what we got. We watched the raging London sunset while we waited to be served by the very accommodating staff. We had the "melt-in-your-mouth" dimsum platter(£17.50) for starter. I was feeling selfish that night so I ordered their most recommended signature dish, the Red Lantern (£36) for my mains. 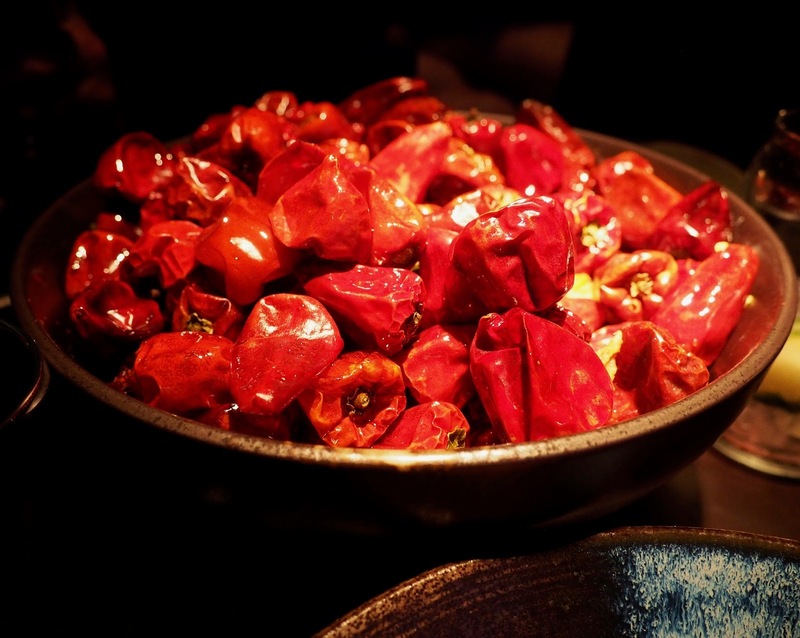 It's basically amazingly flavoured soft-shell crab covered in red chillies. Don't get me wrong, I offered my food to my companions but I don't think they were keen on seafood, so I had the huge bowl to myself. Hehe. On top of that, we also ordered another signature dish, the whole Roasted Peking Duck (£62) which was served in two stages. This, I must admit left me feeling like a very ignorant person. I was expecting the quantity of a "whole duck" to be served, but we had what it seemed like two small portions of duck instead. But to be honest, it was the best duck I've ever had so far. - I was surprised at how laid back the atmosphere was at The Wolseley. I was expecting men in suits and women dressed elegantly, so I felt relieved when I saw diners in their "street-wear" outfits. I thought the place was too crowded and noisy but when we were sat down, my attention was immediately drawn to the historic architecture. The food and service were good. The chopped liver (£9) we had for starter inspired me so much that I made my own version of it on New Year's eve. I wanted to try something I haven't had in a long time so I went for the Schwein (pork) Schnitzel (£20.50), while J opted for the roast chicken (£21.50). - I am not a fan of Gordon Ramsay nor J, but I thought we should try one of his restaurants at least. J came to the Maze Grill with me reluctantly. I mean, the service was warm and friendly, and the food was good. So, I think it is safe to say that we had a good dining experience at the Maze Grill. J enjoyed their tomato soup (£8) while their two-piece buffalo chicken fillets (£7) left me wanting more. 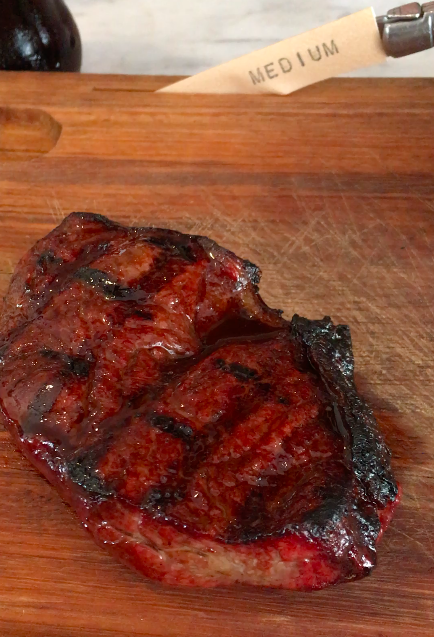 I was missing steak at the time, so I ordered that for my mains (Rump steak £20). J has always been the healthier eater so he had the fish of the day which was seabream. - I learned how to appreciate Indian food more when I started going out with J. I had Indian friends back in Bristol and whenever they brought me food,I always complained that it was too hot. But now, I actually love it. Gymkhana is a good place to go for Indian food in London, and the first photo above says it all. I enjoyed the relaxed atmosphere and efficient service. The food was excellent. Although quite pricey, it's definitely worth the experience. - I guess it is only fair to say that our favourite Chinese restaurant in Chinatown is Orient. Not only that the food is great, but the service is outstanding (you don't normally get that in a lot of Chinese restaurants). Orient is our to-go-to whenever we are craving for Chinese food. Their dimsum platter (£8) is always good as well as my favourite roast duck (£10.50 for quarter). J likes their crispy shredded beef (£10.60). We have also tried one of their set menus, and for £21 per person, it was far two generous for two. 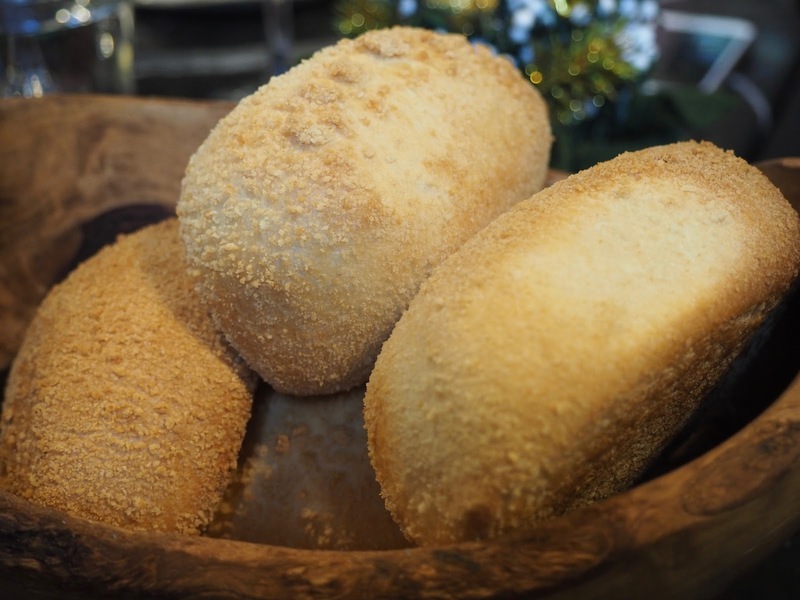 - I can't cook Filipino food very well, and so it is quite important for me to find a good Filipino restaurant in London, and I am happy that I finally found one. The first time I went to Romulo's cafe, I wanted to eat every single thing on the menu. The selection of food was rather impressive- traditional Filipino dishes with a twist. And the service was surprisingly amazing- quick, very friendly and efficient. A few weeks later, I went back to Romulo's twice in a row for my work leaving do and invited my foreign friends. 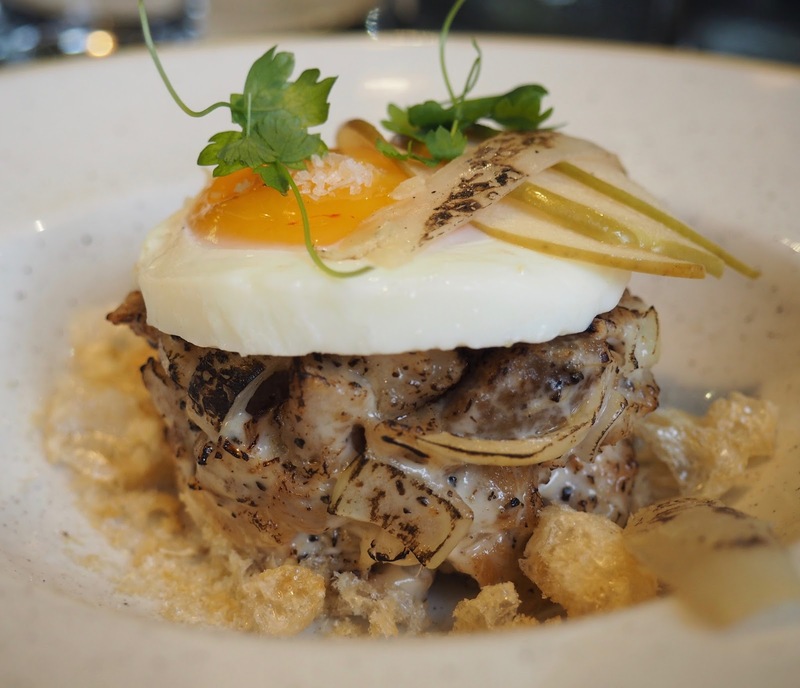 It was their first Filipino food experience and apparently, Romulo's has raised the bar. They very much enjoyed the whole Filipino food experience and would be willing to go back and try other dishes as well. By now, I probably have tried majority of the food on their menu, but my favourites are the pandesal and the sisig. I know it is expensive, but I have been to another fine dining Filipino restaurant in London, and Romulo's is definitely more worthy of my money. Let's just say that in Romulo's, you definitely get what you pay for. I just love food. Do you?